Right from the start of album opener “Days of Our Lives”, it’s clear Restless People aren’t glass-half-empty types. The song’s mantra about being real is effervescent, an instigation to dance amplified by a combination of airy synths, pseudo-rave bullhorns, and precocious rhythms. The clichéd, pure-positive-thinking lyrics aren’t as important as the sheer motivational energy captured in the songs. Vocalist Michael Bell-Smith apparently won’t settle for any crossed arms or polite head-nods. The aptly titled Restless People leans heavily on that same amped-up positivity for the duration of its short, 27-minute runtime. An amalgam of members of Tanlines and a few bandmates from Jesse Cohen’s other gig, Professor Murder, the group creates a celebratory, synth-heavy blend of world beat sounds, a fusion that brings together the perkier elements of its composite parts. The band has also mentioned groups like Gorilla Biscuits and Operation Ivy as influences, which aren’t the outliers they may appear to be– check out the shout-along section of “Victimless Crime”– and put the album’s attitude and rapid-fire bursts of energy into perspective. Such a charging-ahead vibe needs plenty of cathartic moments. Synthetic tribal percussion and horns underlie lyrical musings about changing perspectives on “Little Sky”, a swirling mid-album high point that recalls the Peter Gabriel influence of contemporaries Yeasayer. “Practical Magic” and “Practical Magic II”, back-to-back songs animated by stomping, crisp rhythms, rubbery bass, and an early-90s dance breakdown, build to the big ending on closer “Victimless Crime”. 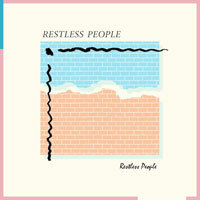 Restless People never sound rudderless, but even during such a brief album, they sound like they’re treading (or bouncing) over the same ground a little bit. The template doesn’t vary too much, and the lyrics, while just as energizing as any other instrument on the record, don’t have quite the depth they could. High-energy dance music doesn’t require any excuse or explanation, and Restless People rarely provides one.